RHYTHM OF THE NEEDLES: April Fool's Prank? No, not a joke. 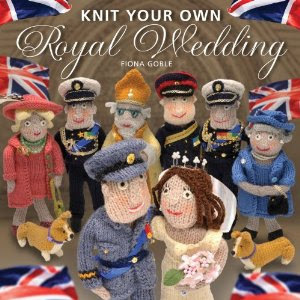 I really am going to knit a couple of the projects from "Knit Your Own Royal Wedding". My plan is to make Queen Elizabeth II and a corgi. I'm sure that I've got all the yarn I need in my stash. 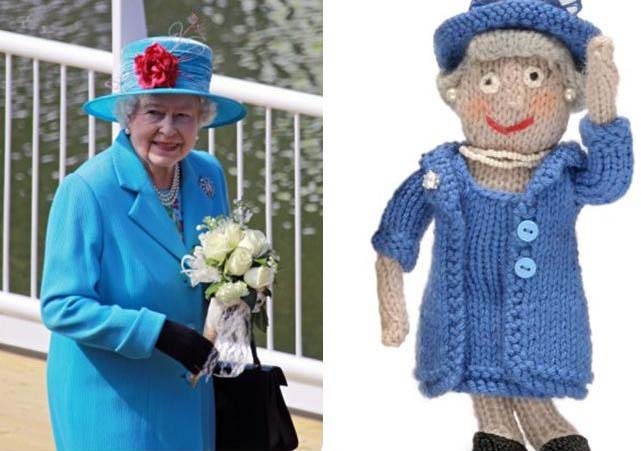 Queen Elizabeth II - real and knitted! This will be very early Christmas knitting. I don't usually like doing anything for Christmas until it's close to the holiday season, but I'm going to make an exception this time. My Mom has a little Christmas tree that she calls her "Funny Tree". On it she puts all kinds of unique ornaments, everything from a funny little plastic Snoopy with his tongue stuck out to a beautiful silver angel that she got in Mexico. Each year I try to come up with something new and whimsical, but it gets harder and harder to find something that's special. I can take my time with this project, starting with raiding the stash! 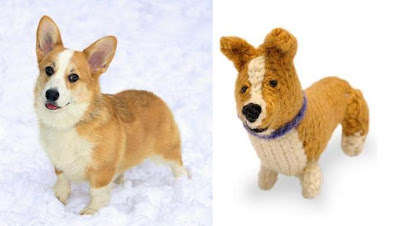 That's going to be so adorable!